VIDEO The main headquarters of the DPR army has made a decision to stop operations in small groups and form full-bodied independent military units, the anti-Kiev forces say in a summary of their operations filed on Sunday. Some 5,000 Kiev troops “with military hardware” including some 50 tanks, over 200 armored vehicles and 50 artillery rocket systems (including Grad) are trapped in the area, the DPR claims. “DNR’s army has surrounded the staff headquarters of the 8th army corps, 28th and 30th mechanized brigades, 95th air mobile brigade of the army of Ukraine, and also punitive battalions ‘Aidar’, ‘Donbass’ and ‘Shakhtersk’,” the document claims. 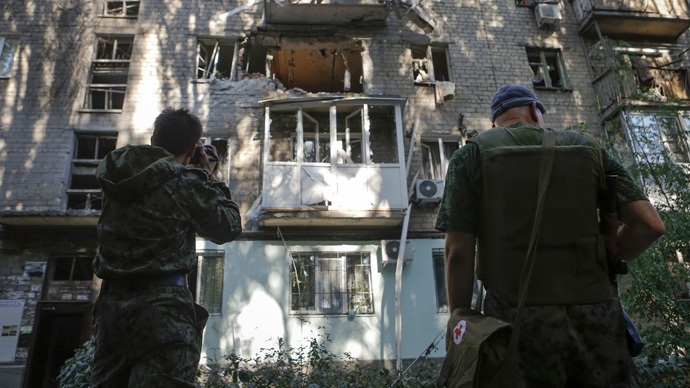 However, Ukraine's National Security Council (SNBO) denied the claims. 2,000 more Kiev troops, armed with 30 tanks, over 80 armored vehicles and more than 60 artillery pieces and mortars, have been engaged and are currently being eliminated near Olenovskoye, the anti-Kiev forces said. According to the National Security and Defense Council (NSDC) of Ukraine, information about thousands troops being pinned down in the east of the country is not true. The council says “not a single serviceman” has been surrounded during the last three days and that troops continue to successfully attack “territory temporarily occupied by terrorists.” Over the last two days, the self-defense forces say they have captured a lot of military hardware. This has reportedly helped them get 2 tank battalions, 3 multiple launcher rocket system batteries, 2 self-propelled howitzer batteries, 3 cannon battalions of various calibers and 8 mortar batteries. All the new subunits have joined the newly formed fighting force, the rebels said. Three infantry brigades will be organized from the existing detachments of self-defense militia, the document reads. A new volunteer regiment has also been formed consisting of miners from the Donbass region and soldiers and officers from the Ukrainian army, who have opted to side with the People’s Republic of Donetsk. Moreover, the DNR army says it has destroyed four ‘Smerch’ multiple rocket launch systems, 12 ‘Grad’ multiple rocket launch systems, 17 tanks, 30 armored vehicles, 50 supply trucks, and killed over 150 enemy personnel. “We have captured 7 military supply depots with large quantities of armaments, munitions, aids and appliances, food rations and property of the citizens expropriated by the National Guards during mopping-up operations, including all-terrain vehicles. From now on we intend to utterly annihilate enemy forces trapped near Olenovskoe and the communities of Kuteinikovo-Blagodatnoye-Uspenskoye,” HQ said. The DPR army has also reportedly “liberated” a number of communities such as Agronomicheskoe, Klenovka and Stroitel from the Ukrainian troops’ and National Guards’ “punitive detachments”. 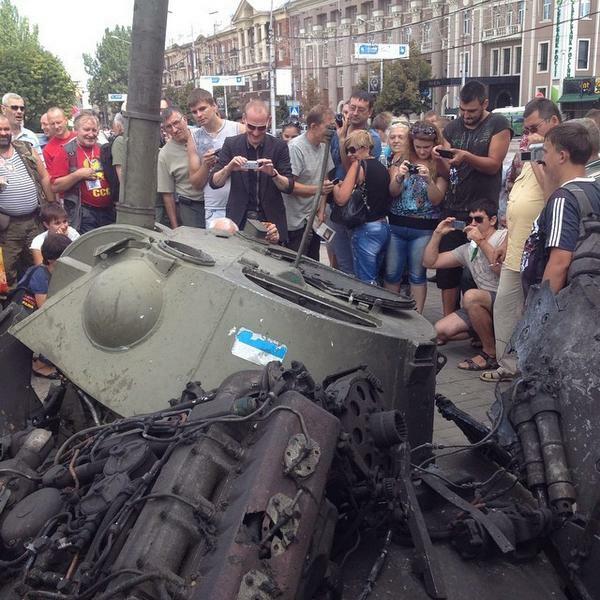 Some of the seized hardware was paraded by anti-Kiev forces in Donetsk Sunday. However, it was not clear where the trophies came from.